We are very pleased to introduce you to our next fenomenal woman, Venla Luukkonen, 2013 brown belt heavy weight world champion. Venla is one of the few ladies who gets excited if she has a chance to fight Gabi Garcia. She talks about her life, and training in Finland, and the challenges she faces as a heavy weight competitor. Everyone meet Venla! I am 29 years old and currently reside in Jyväskylä, in Central Finland. I live together with my girlfriend Hanna who also trains BJJ, and we have three cats. I’m a brown belt in BJJ and I also train submission wrestling. I do approximately 50:50 gi and no-gi training depending on the upcoming competition. My academy is called Jyväskylän Fight Club, and at international tournaments we represent Hilti BJJ Jyväskylä. I graduated as an elementary school teacher in 2010, and continued studying almost right away. Currently I’m working on my PhD in the education field. The dissertation should be at the end of 2014, so I still have about one year to go. Post-graduate studies have been a perfect combination with training and competing as I am quite free to plan my own schedule. Do you have martial arts background? Did you do any other sports before BJJ? When I was about 7 years old, I started dancing and continued with that throughout elementary and middle school. I did modern dance, jazz and also a bit flamenco. I also trained track and field, and played floorball in early teens. Sport was a hobby alongside theater and music, however music and playing saxophone was the most important to me. When I moved to Jyväskylä in 2004 to study, I started doing capoeira. I really liked the combination of music, dancing and fighting. One of my fellow capoeiristas introduced me to BJJ, and we were a group of four going to the beginners’ class in 2008. I fell in love with grappling. In the beginning I tried to train both capoeira and grappling but when I started competing more and more, it became hard to focus on both. I still go to capoeira occasionally but BJJ and grappling are closest to my heart now. You are one of the highest ranked women in Finland. What obstacles have you encountered on your BJJ journey? My journey has been quite smooth, if I can say so. I have not had any major injuries and the attitude towards women training at our academy is really encouraging. Even though we are a minority you can really see us affecting the gym atmosphere. As a competitor, it is sometimes challenging that there are not many higher belts actively competing. I do not have enough variety in sparring partners before the tournaments. Hanna and I work tightly together, coaching each other and other competitors. It would be nice to have some jiu-jitsu guru coaching us every now and then. Luckily Hanna is really good at analyzing the game, and working together has brought us quite a long way. We try to go to seminars, and visit other academies to develop our game, and of course compete a lot to see how it is working. The competition opportunities are rare though. After you reach a certain level as a woman in Finland, it is almost a must to travel abroad to compete. 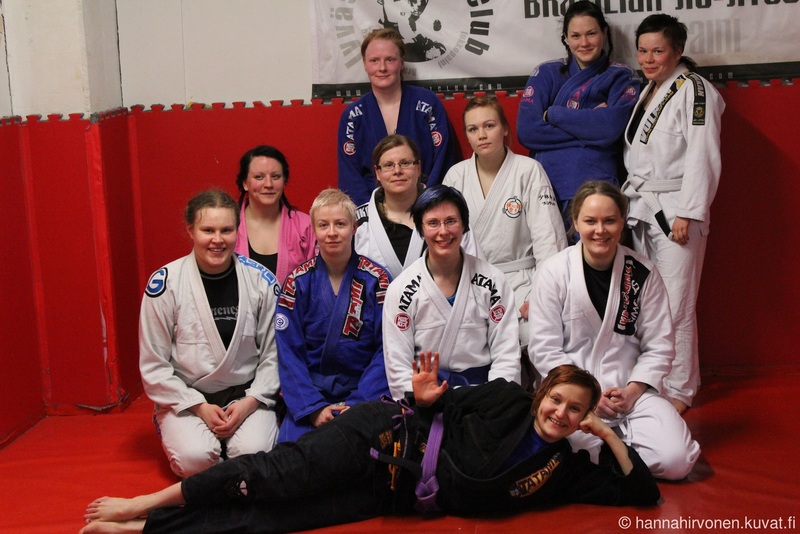 The level of BJJ in Finland is really good but just not enough women at higher ranks yet. We have only two brown belts and about seven purple belts in the whole country. What do you like about competing? Which tournament is your favorite so far? I have thought about this a lot because I am not a very competitive person. I really liked performing in concerts, and also playing the solo parts when I was actively playing saxophone. Somehow competing gives me the same feeling as performing in music. In tournaments I can also see how my jiu-jitsu is developing and find new things to work on. The most memorable tournament thus far has been the World Pro in Abu Dhabi in 2012. It was the first time I got to compete with the black belts. I had Gabi Garcia in my division, and I really wanted to fight her because she is the best in heavy-weights. I was so thrilled but then lost in the semi-finals and did not get to go against Gabi. Later in the open weight class I was luckier, and after winning two fights I had a chance to fight her. I lost to a choke at about 3 minute mark but I was happy to compete against her. Some academies prefer competitors over BJJ hobbyists. Do you think everyone must compete? Even though I love competing, and I consider it the best way to see how one has developed, I think it is totally fine to just train. When we have new students coming in, we try to encourage them to compete at least once to see what they think about it. But if one wishes not to compete, it is fine as well. Most of the people at our academy are not active competitors. Sometimes it is a little bit frustrating when I’m trying to get ready for tournaments, otherwise I do not mind. What has been the most difficult belt level (white, blue, purple or brown) and why? I would say brown belt due to the rare competition options. Being a heavy weight girl makes it even harder. It is frustrating to check out the list of competitors and wait if I get any opponents. This happens in high level competitions. At the Mundials this year I was lucky to get two opponents who for some reason did not want to compete in their own weight classes. 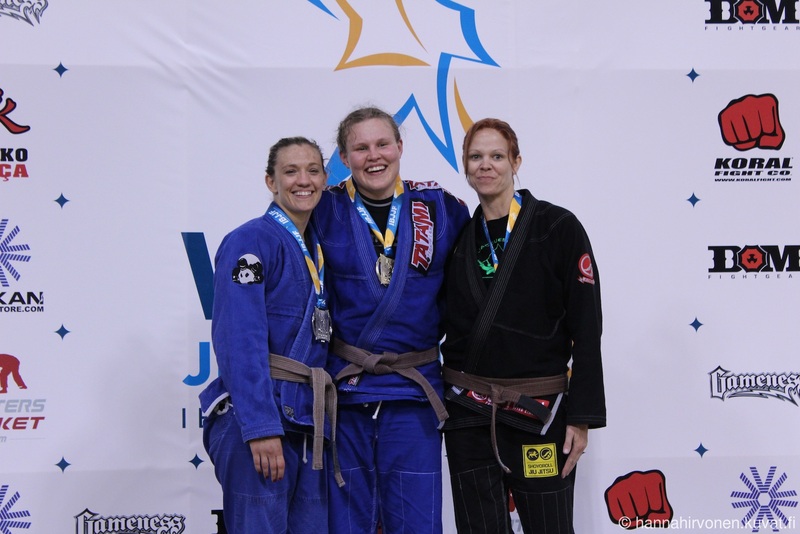 At Rome Open and No-gi Europeans there were only two girls in brown belt categories. Luckily Janni Larsson changed her category for heavy weight and we got to fight four times with each other. I hardly ever get to fight more than one girl my size. The lack of heavy weight girls has affected my motivation but at the same time I know that the sport is still quite new here and in a few years hopefully there are more girls competing. You and Hanna will be teaching a women’s jiu-jitsu seminar in December. Is that your first event or do you teach regularly? Actually Finnhits in November and our camp in December are the first seminars I will be teaching. I teach women only and co-ed classes regularly at our academy though. We started with women only classes in 2009. We had a small group of seven girls but it grew after Hanna moved to Jyväskylä in 2010. She is a really talented instructor, and I have learned a lot from her. Now we have three female instructors. I think the secret for our success is that we do exactly what guys do: train, compete, teach and referee. It is still hard to find enough women to keep up with BJJ for more than a year – people move, have babies, change hobbies, but for now we have a core group training and competing. The guys have always been really supportive, and actually girls are even taking over the academy now. We named our girls training Jyväskylän Fight Like a Girl Club. Most of our girls and guys sport a shirt or a black hoodie with our logo. We have also organized two women only amateur MMA events, which were very popular. This has more to do with our cats than me! During the last few years some the instructors who have visited Jyväskylä have stayed at our place. It is very cute to see high level competitors, girls an guys, being entertained by the three princes of the house. For example, when Martin Aedma was visiting, he shared his yogurt with one of the cats. One spoonful for Martin, one for the cat 🙂 Two of the cats also love to grapple, so it never gets boring! 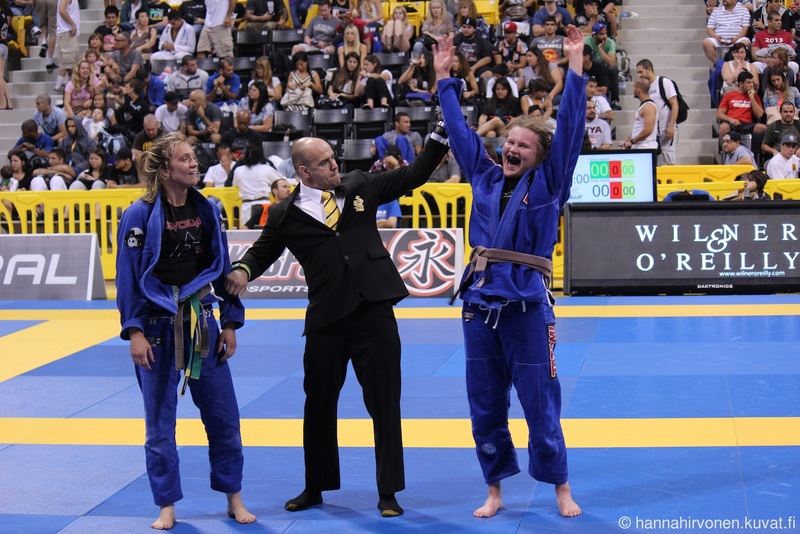 June 2014: Check out BJJ Scandinavia interview with Venla, and see what has happened since she got promoted to black belt!